Jaguar knows how to make a good-looking car. 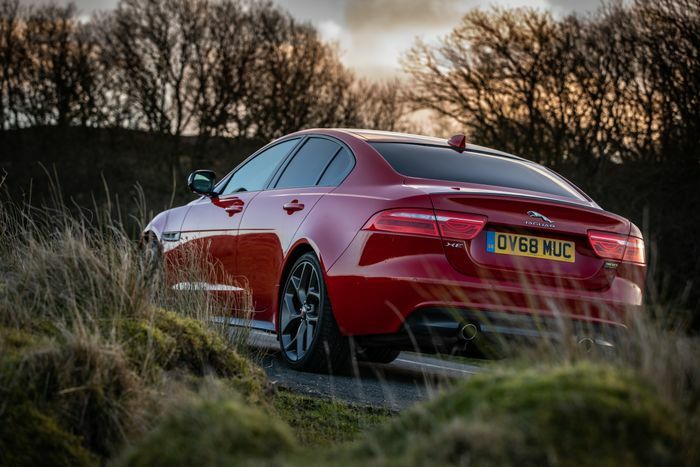 The XE 300 Sport before me is proof positive, all lithe and taut in this range-topping spec. Neat, muscular lines turn a traditional three-box shape into something altogether more tempting. In a class of highly Germanic and increasingly awkward designs, the littlest Big Cat is the looker. It’s a treat for the peepers on the inside, too. 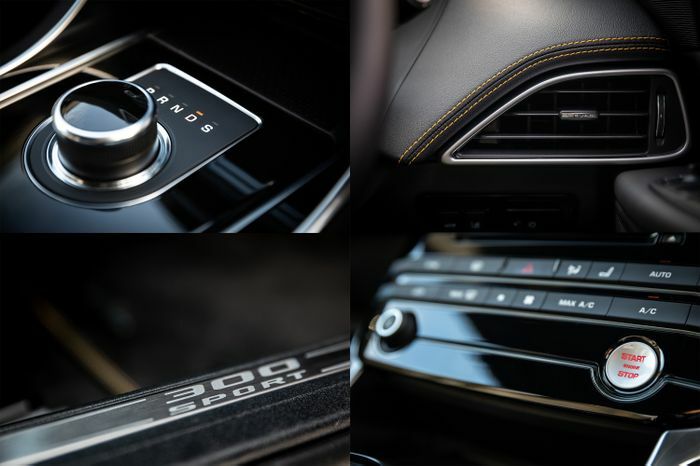 Perforated leather seats are confidently accented by yellow stitching that also traces a contrasting path along the forward edges of the black dashboard, door trim and steering wheel. Centre stage is a 10-inch widescreen display, here upgraded to the fascinating and oh-so-weird £625 Dual View item, where on the same screen the driver and passenger can be looking at totally different things at the same time, without seeing what each other is seeing. I slide into the driver’s seat to find comfort awaits. There’s huge adjustment in the 10-way powered seats fitted to this car as a no-cost option, and while the rotary dial-style release for the steering wheel is unusual, there’s ample fore-aft movement. Finding your perfect driving position is as much a doddle as pairing a phone to the media interface. Rear passengers won’t thank you, though – at just over 5’10” I’m no giant but there’s very little legroom behind me. I could manage with the seat further forward if I had to. After taking-in the high-shouldered, wide-feeling cabin I reach for the start button adjacent to my left knee. Its red backlight pulses like a heartbeat in anticipation. Then… the four-cylinder Ingenium engine starts with an unexpected clatter and an almost diesel-ish air that continues when I turn the newly-risen gear selector dial to D and roll away. It’s only under harder acceleration that the 296bhp unit starts to emit a much more palatable, woofly growl. 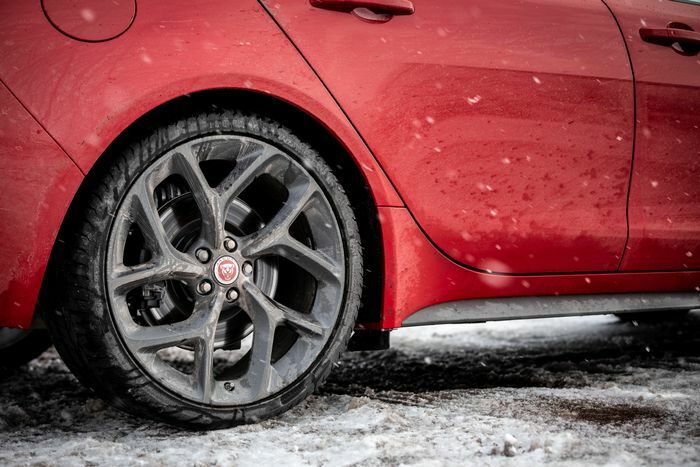 All-wheel drive is welcome in this typically Welsh winter weather. Snow usually visits this part of the world sometime between January and March and the lower grip shows-up a flaw in the XE’s setup. With a decent amount of lock applied, like when exiting a T-junction, the front wheels skip outwards as if being forced by an over-eager limited-slip diff. First gear is surprisingly low, too, and pulling out of junctions with lock applied can be jerky, despite unflappable AWD traction. 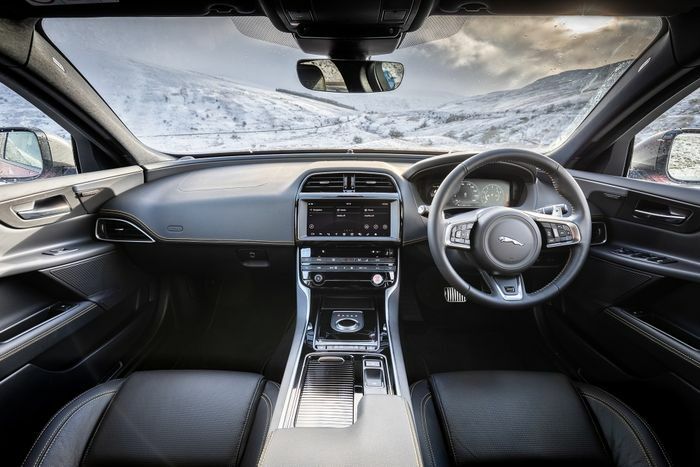 If you’d prefer to shift via the eight-speed ’box’s steering wheel-mounted paddles, starting off in second gear is a much better bet in all conditions. In faster turns a hint of chassis playfulness emerges. After warming the engine through, I floor the throttle through every corner for a three-mile B-road stretch and a subtle rearward bias reveals itself. The balance is perfect; body control tightens beautifully and allows me to wind the lock off that little bit faster as the back end gets involved. It’s supremely confidence-inspiring. Third gear is fabulously flexible for country roads, topping out at over 70mph but just right for riding a 295lb ft torque wave out of 40mph bends. Fourth should take you beyond 90mph, while after that the ratios start to spread out for efficiency. At 70mph, eighth clocks just 2000rpm. There’s a little uplift in acceleration at 4500rpm in the wake of a useful and linear midrange. There’s less top-end excitement than the chassis deserves, though. Don’t get me wrong: the 300 Sport is deceptively fast. 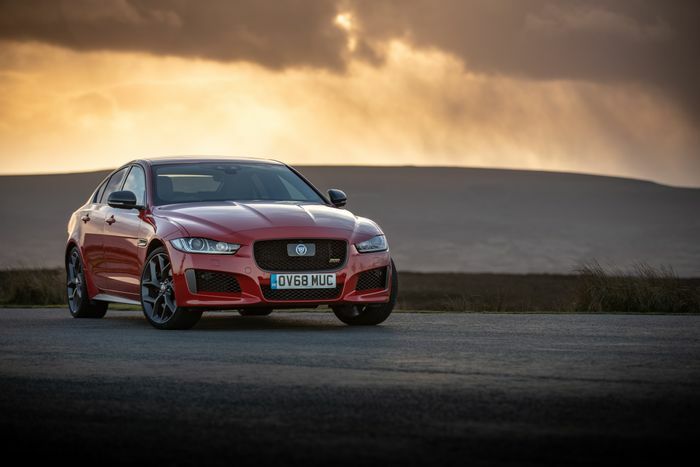 It’s just that the engine feels somewhat removed from the experience, to the benefit of refinement and capability, but at the cost of the outright thrill. 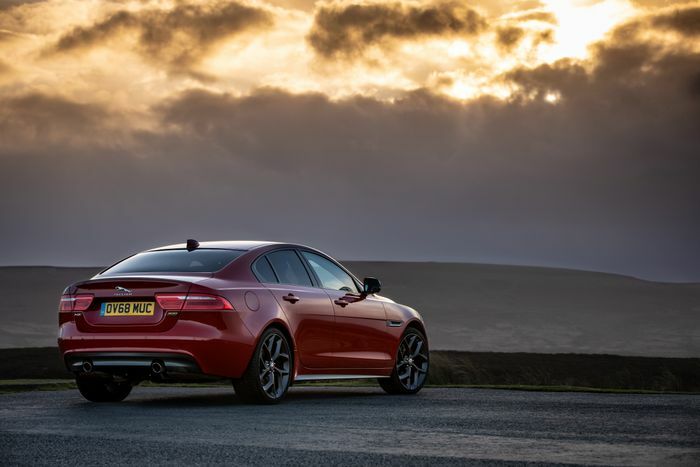 If the lack of aural drama on corner exits is a big change, so is the way the XE turns in. Fat, sticky Pirelli P-Zero tyres cling like baby sloths even to freezing, wet corners and allow the fast, accurate and even vaguely feelsome (at speed) steering to work its magic. The 300 Sport has a wonderfully darty and eager nose that, especially with the chassis in Dynamic mode, loves hunting apexes. This is a genuinely talented car in which to chase countryside horizons. The only black mark for me is the variable-weight steering. When you have to slow hard for a 20mph hairpin the rack goes light, loses all feel and almost gives the disconcerting turn-in impression of hitting ice. Although the heated seats take a while to get their act together, overall comfort is astonishingly good. 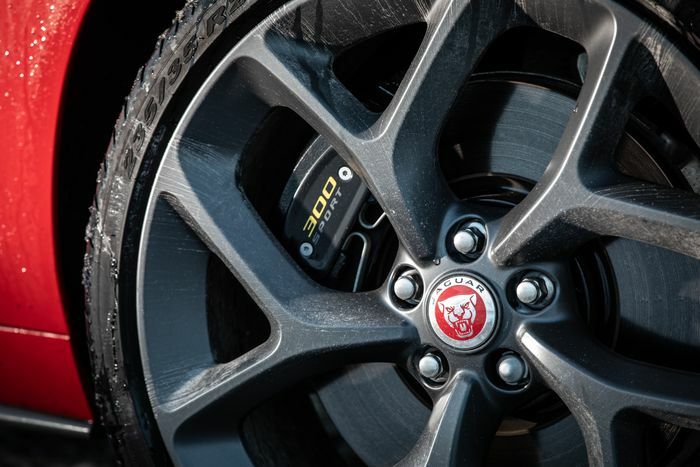 Those Pirellis are hefty 20-inch items in rubber band-spec profiles, remember, but in Normal chassis mode it floats without making passengers feel seasick, takes speed bumps in its stride and maintains an impressive level of body control. It’s equally good in Dynamic, but tighter and more focused throughout. As I return home at the end of a dirty Welsh evening in the XE’s company, its headlights are still mighty even when caked in road filth. LEDs may be the vogue right now but the beam from these bi-xenon units is as bright and broad as you could wish for. A final criticism falls upon the reversing camera, which seems to attract dirt instantly and is then all-but useless. 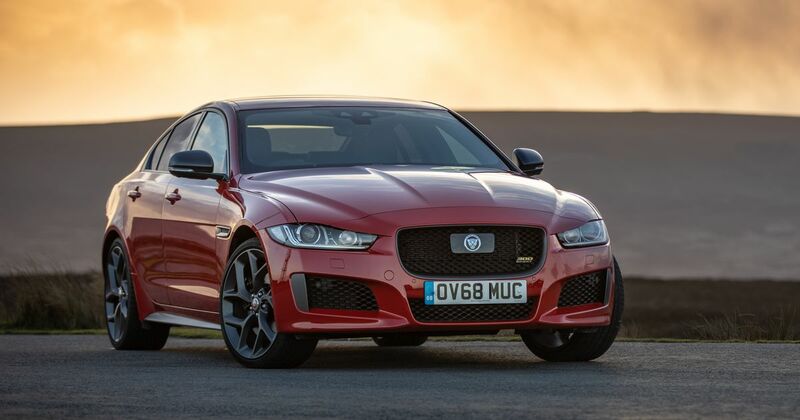 The loss of Jaguar’s V6 was a blow to the XE’s breadth of character, taking away something that no rival had. The realities of fuel prices and emissions laws made the four-cylinder replacement inevitable, and I admit to being a mite resentful. Then again, I also admit to underestimating the 300 Sport. Despite its less charming powerplant it plumbs new depths of handling talent on any road you care to try and sets itself right up there as a class leader both for dynamics and comfort. What an achievement.